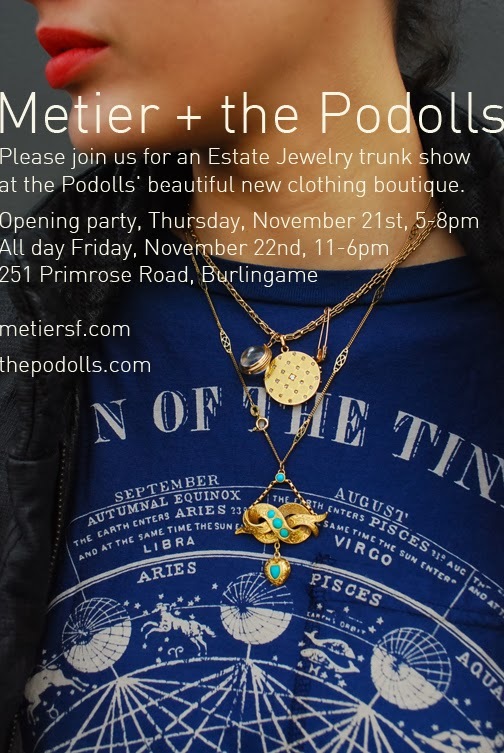 We're excited to bring Metier's jewelry collection on the road to The Podolls new store in Burlingame. 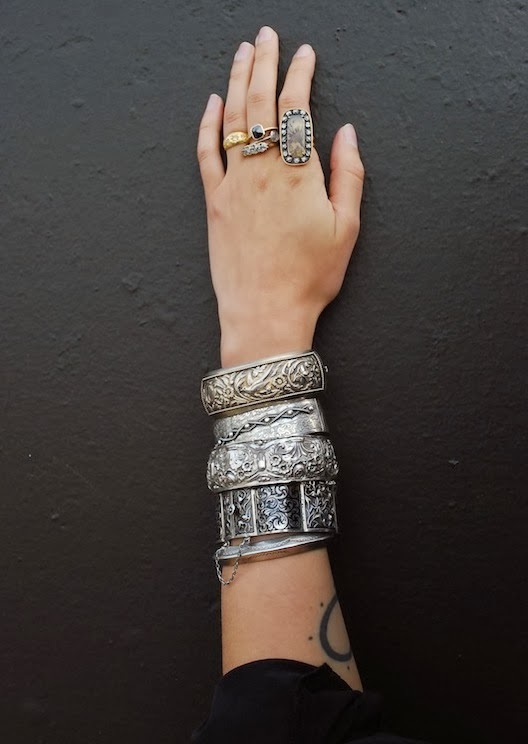 The collaboration inspired us to style a series of looks with our jewelry and their clothing and accessories. This is just a teaser with many more one of a kind beauties to come next week at the event. We'd love to see you there! 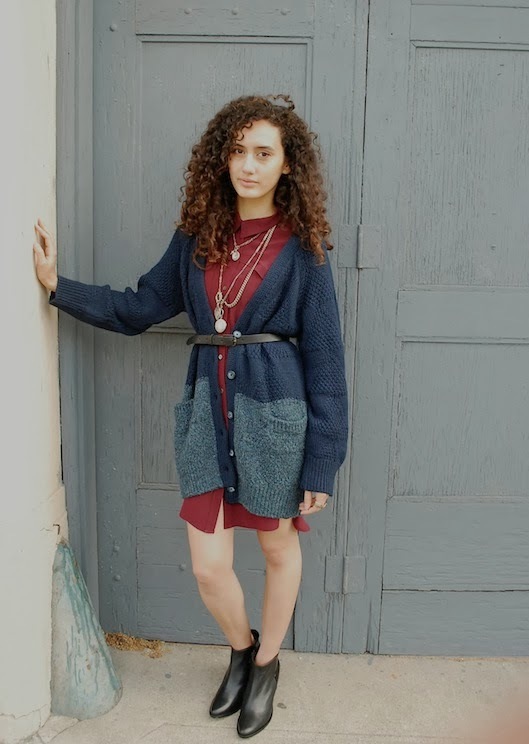 The Podolls Trench Dress in Burgandy Washed Silk $302, Micaela Greg Colorblock Cardigan in a Wool Alpaca Blend $408, Freda Salvador Divide Boots $575. All available at The Podolls Store 650-389-2346. 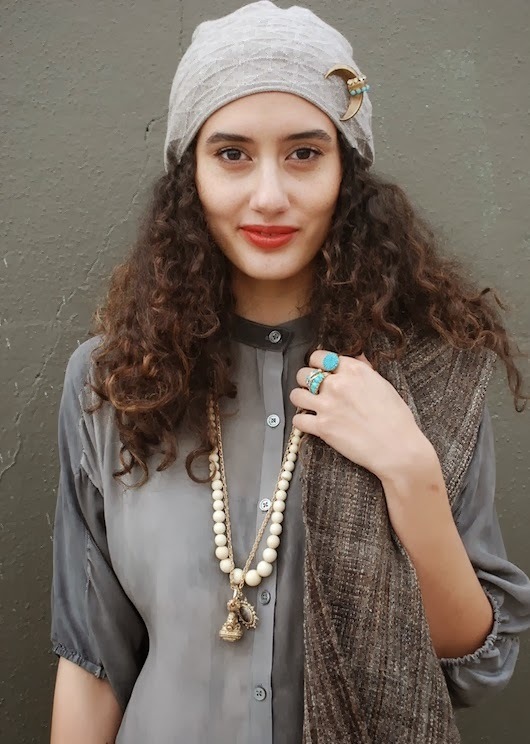 The Podolls Winged Blouse in Silk Crepe $235, Micaela Greg Fragment Beanie $88, Kutch Handloomed Wool Throw $215. All available at The Podolls Store 650-389-2346. Vintage Rhinestone Moon Pin above, Necklaces Vintage Resin Beads, Antique 14k Gold Double Coil Link Chain, Mother of Pearl Cameo Fob, Antique Plumed Agate and Seed Pearl Pendant. Rings Antique Turquoise Dome Ring, Antique Turquoise and Diamond Band, Antique 18k European Cut Diamond Ring, Antique Turquoise Cabachon Band. 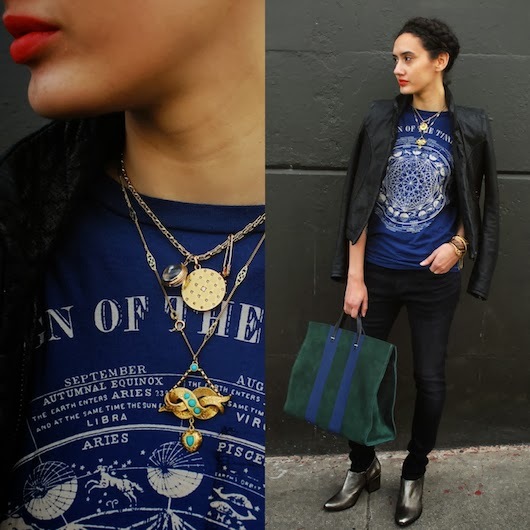 Claire Vivier Green Suede Tote with Navy Stripes $368, Freda Salvador Moon Shoe-boots in Bronze $550. All available at The Podolls Store 650-389-2346. 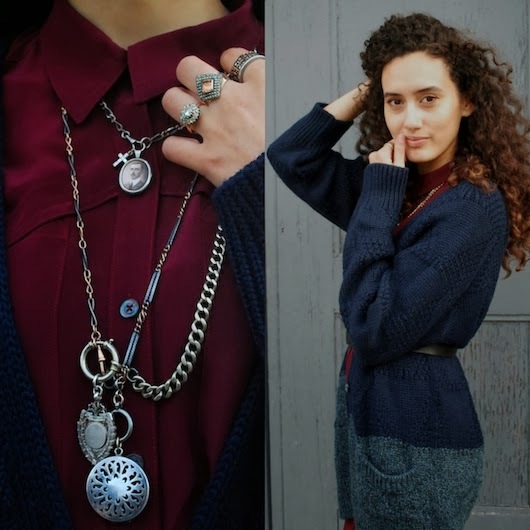 Necklaces Antique 14k Gold Double Coil Link Chain, Antique Rock Crystal Locket, Victorian Locket w/ Rose Cut Diamonds, Conroy & Wilcox 14k Safety Pin Earring (as a charm), Vintage 14kt Italian Chain, Antique Gold and Turquoise Ribbon Pendant. 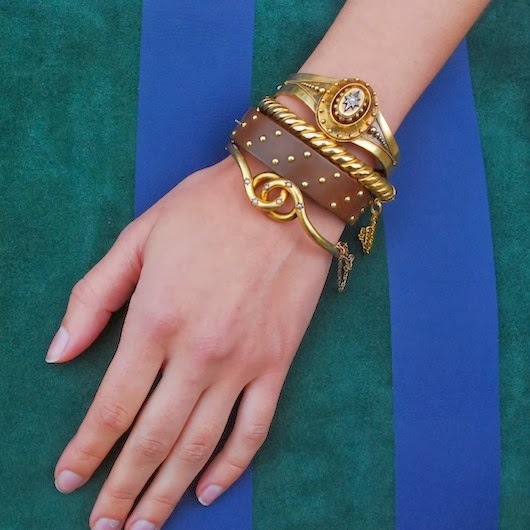 Bracelets Antique Oval Bracelet w/ Blue Enamel & Pearls, Gold Rope Motif Bangle, Victorian Gutta Percha and 14k Gold Studded Bangle, Victorian Love Knot Bangle. Rings Victorian Diamond Star Band, Conroy & Wilcox Emerald-Cut Black Diamond Ring, Conroy & Wilcox 18k White Gold and Rose Cut Diamond Ring, Antique 18k European Cut Diamond Ring, Georgian Moss Agate Ring with Cushion Cut Diamonds.